The two-day conference aims to present a comprehensive, comparative appraisal of the structural features underpinning a human universal concern, uncertainty. This concern was commonly expressed in early text cultures through divinatory practices. For the purposes of this conference, divination will be understood as an activity devoted to uncovering the hidden significance of events and signs, with the latter being either directly observed in nature or deliberately obtained. We intend to broaden the widely accepted concept of divination as the mere act of foretelling the future. Such mantic activities may include, but need not be limited to, communication with transcendent realities conceived both as divine beings or as universal cosmic order. Our investigation will focus on early text cultures, defined as pre-modern cultural contexts whose mantic practices can be reconstructed through the aid of written texts and archaeological material. In particular, we are keen to explore the importance of texts such as divination manuals, almanacs, oracular procedure and prescriptive texts, divination records or archives, and the close correlation between transmitted and excavated sources. In this regard, our main references are La divination. Études recueillies, edited by A. Caquot and M. Leibovici (Paris, 1968), which offers an account of divinatory activities in a wide range of both ancient and modern societies; as for what concerns the socio-epistemological dimension of the mantic practice, we mainly refer to Divination et rationalité, edited by J.P. Vernant (Paris, 1974) and Divination and Prediction in Early China and Ancient Greece, by L.A. Raphals (Cambridge, 2013). More recent studies on divination focussed either on specific issues (Divination and the Interpretation of Signs in the Ancient World, edited by A. Annus, Chicago 2010) or on a limited geographical area (Coping with the Future: Theories and Practices in East Asia, edited by M. Lackner, Leiden-Boston 2017) and an over-arching perspective on mantic practices has not been provided since the publication of the above-mentioned volume edited by A. Caquot. However, in the past few decades, new archaeological and palaeographical sources have made it possible to reconsider several aspects of divination. For instance, the discovery of inscriptions related to the socalled shuzi gua 數字卦 (lit. ‘numerical divinatory symbol’) has significantly contributed toward a new understanding of yarrow stalk divination, whilst the emergence of lots from the Greek sanctuary of Dodona shed new light on how queries were addressed to the oracle and on the oracle’s response. We already cover China, Rome and Etruria, Greece and the Celts, and our confirmed key-note speakers will be Professor Robert Parker (Oxford) and Professor Bernhard Maier (Tübingen). We are looking for contributors on the surviving corpora available for Mesopotamia, ancient Egypt, Israel, pre-modern Islamic areas, ancient India, Japan, as well as Medieval Europe, covering the Slavs and the Germans. How is divination defined and conceptualised in each society? What are the sources and texts through which we can reconstruct how divination worked? How do different material supports affect the ways divination is performed? Who were the practitioners? Were they professionals or amateurs? Did they have connections with a temple or a court or were they independent? What was their cultural background? What were the techniques employed by these practitioners in interpreting divinatory signs, either natural or deliberately created? Are there any typological similarities in a set of practices which represent a shared feature among most ancient societies? If that be the case, is it possible to bring out distinctive aspects peculiar to each society within the complexity of the mantic art? The event will be held in Oxford on 24-25 June 2019 at the University of Oxford China Centre. We welcome up to 500-word proposals for 45 minutes talks which should be sent to domenico.giordani@sjc.ox.ac.uk and flaminia.pischedda@pmb.ox.ac.uk by 26 April 2019. We expect a monograph or a special volume on a journal to emerge from the conference discussion, conceived as an up-to-date, cross-cultural overview of divination in early text cultures. We are ultimately looking to make a decisive contribution in the field of religious and socio-cultural studies, ideally constituting both a useful tool for advanced scholars and a general reference for those who are approaching this area for the first time. The Conference is sponsored by the ARHC-TORCH Grad Fund, the Centre for Manuscript and Text Cultures at The Queen’s College (CMTC), Pembroke College, and supported by the University of Oxford China Centre. Organised by China’s Health, Environment and Welfare (CHEW) Research Group. 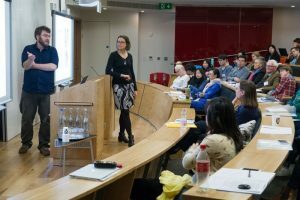 Hosted and funded by the China Centre with support from the Oxford School of Global and Area Studies. More than five years into Xi’s leadership, and less than two years until the target date of 2020 set by the Chinese Communist Party to achieve a ‘moderately prosperous society’, time has come to take stock of the country’s evolution. What are the challenges faced by present-day China, how have they been addressed in recent years and how may they evolve in the future? The Conference started on Friday 12 October at 2:45 with a keynote talk by Prof. Genia Kostka from the Free University of Berlin on ‘Tightening the grip: environmental governance under Xi Jinping’. A roundtable on social activism in today’s China moderated by Prof. Anna Lora-Wainwright followed. On Saturday 13 October, several panels enabled conference participants to continue exploring how the political and institutional changes carried out by the Xi administration have impacted the way in which Chinese actors mobilise and engage with environmental, health and welfare issues across administrative, geographic and technological boundaries. Balancing Environmental and Social Justice: Implications of China’s Stronger Environmental Protection Policies for Rural-Urban Inequality. Confucian Philosophy, Education, and Ecological Sustainability. Societal Empowerment for a Better Future in China. ‘Ecological Civilization’ and the Continuation of Modernization Politics in China. Microcredit, Modernity and Marginalisation in Rural China. Would the ‘Online Public Voice’ be Considered by the Chinese Government During the Environmental Crisis? The Preformative Eco-Friendly Farmers: Governmentality and Regulation of Animal Waste Practices in Hong Kong (1973-1997). Solving the Negative Externalities of Factory Farming in China Intensive Livestock Production. Patriotic camels and the Political Ecology of China’s Borderlands. There is much current interest in causes of globalization and international contacts. Although the process of globalization has sped up considerably over the last decades, recent research has suggested that the modern and the ancient world may not be fundamentally different as far as mechanisms and preconditions of inter-cultural contact are concerned. Prehistoric and early historic communities can therefore serve as useful case studies to reflect on general mechanisms of inter-cultural exchange that are of great interest to modern day societies as well. 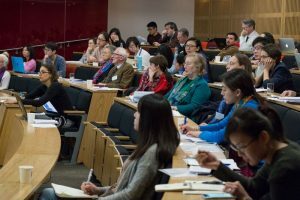 The conference on “Cultural Contacts in Ancient Worlds: Theories and Case Studies” held at Oxford, 24 to 26 March 2017, brings together researchers from various fields in the humanities and social sciences to gain deeper insight into mechanisms of and reasons for inter-group exchange across Eurasia in historic and prehistoric periods. Oxford China Humanities Graduate Conference 2017. Andrew Jones, Professor and Louis B. Agassiz Chair in Chinese, University of California, Berkeley. Craig Clunas, Professor of the History of Art, University of Oxford. “Everyday life invents itself by poaching in countless ways on the property of others” – Michel de Certeau. Graduate students are invited to submit abstracts for the inaugural University of Oxford China Humanities Graduate Conference 2017, which takes the theme of ‘the everyday’ in the Chinese context as its point of departure. We welcome papers that work with modern and pre-modern subject material and from all the humanistic disciplines, including history, literary and cultural studies, history of art, film and media studies, philosophy, human geography, anthropology, musicology, politics, and religion. This conference asks applicants to draw on their graduate research to critically engage with practices of the everyday across Greater China. How has the everyday been articulated, invented, transcended, and resisted throughout the history and culture of the region? How have marginalised individuals and groups negotiated their everyday practices within wider structures of power? What does everyday creativity look like? And where do material objects, landscapes, and animals fit in to our perception of the everyday? As a theme, ‘the everyday’ in China has often been shortchanged in favour of so-called grander narratives of history and power. Over the course of this conference, we aim to remedy this and build up a picture of China which is framed by the local and quotidian. The CHEW (China’s Health, Environment and Welfare) Conference 2016, ‘Visible and Invisible Challenges: Transformations in Contemporary China’, took place on 20-21 May in the China Centre and Green Templeton College. Scholars gathered to discuss several key topics including ‘Environmental Activism’, ‘Waste and Society’, ‘China and the World’, ‘Society, Politics and Exclusion’, ‘Safety and the Environment’, ‘Resources, Policies and Practices’, ‘Civil Society’, and ‘Urban Challenges’. The opening lecture was given by Professor Jane Duckett, University of Glasgow. ‘Digital Culture in Contemporary China, Taiwan, and Hong Kong’ is taking place in the China Centre on 17-19 December 2015. To register, please contact Elisabeth Forster (elisabeth.forster@history.ox.ac.uk) indicating which days you would like to attend. Registration is free. Please see programme details on the China Centre website. The 2015 CHEW Conference aims to bring together academics, policy practitioners and other experts from diverse disciplinary backgrounds working on a range of contemporary issues relevant to China’s health, environment and welfare. Our focus is on policy reforms recently implemented in these areas and their observed or likely effects, and also on suggestions for new reforms required to meet the challenges. The one-day conference will be held on Saturday, 23 May at Oxford. On the evening of Friday, 22 May, there will be a specially featured roundtable discussion during which prominent China scholars will offer their thoughts on the theme of the conference. All conference participants are invited to the discussion.